M-SPAN leaders and staff traveled to Washington D.C. in mid-October for the 2018 Bristol-Myers Squibb Foundation Grantee Summit. 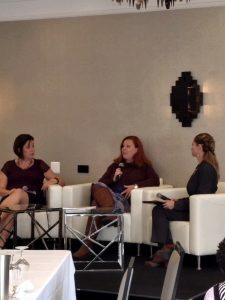 M-SPAN Director Jane Spinner and lead Principal Investigator Michelle Kees were joined by Tim Nellett, PAVE Program Coordinator, and Jennifer Lamb, HomeFront Strong Program Manager and After Her Service Program Trainer, to represent the PAVE and AHS Programs at this summit held every year by the Bristol-Myers Squibb Foundation, the funder for those programs. 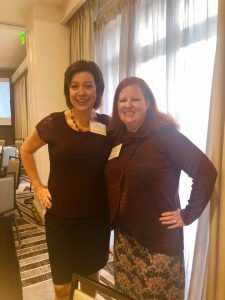 Michelle Kees and Jennifer Lamb at the BMSF Grantee Summit. 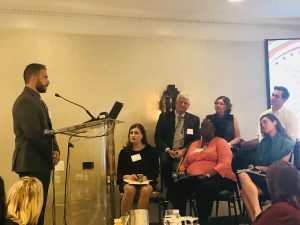 PAVE Program Coordinator Tim Nellett giving a “Shark Tank”-style presentation about the PAVE Program at the 2018 Bristol-Myers Squibb Foundation Grantee Summit in Washington D.C..
M-SPAN’s Michelle Kees and Jennifer Lamb presenting on the After Her Service Program with veteran and author Kayla Williams at the 2018 BMSF Grantee Summit.